paneer kheer recipe | paneer payasam | paneer dessert recipes with detailed photo and video recipe. a perfect diwali dessert to finish your diwali celebration feast with other sweets and snacks recipes. 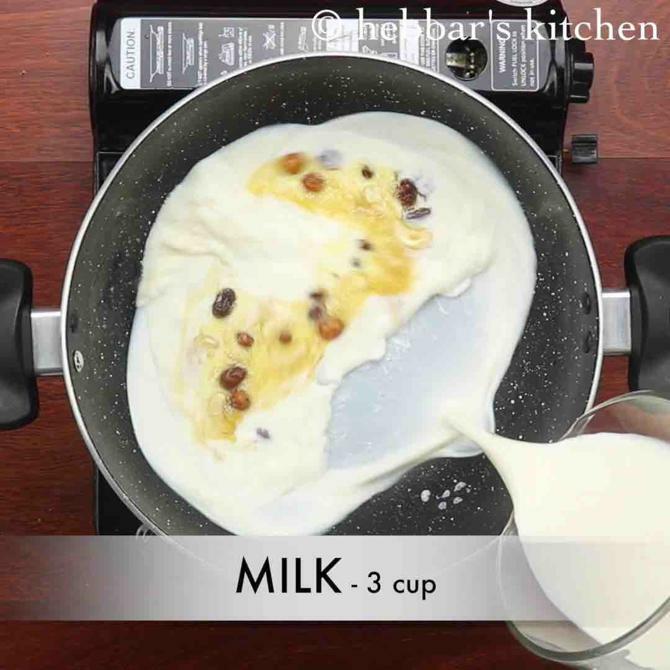 it is one of the quick and easy, milk based creamy dessert recipe prepared within 15 minutes. it can be served either warm or chilled and mixed with vanilla ice cream. paneer kheer recipe | paneer payasam | paneer dessert recipes with step by step photo and video recipe. the texture and taste has a strong resemblance to basundi or rabri but still has a unique flavour of crumbled paneer. paneer payasam is typically garnished and served with fried dry fruits like almonds and cashew’s with some raisin toppings. 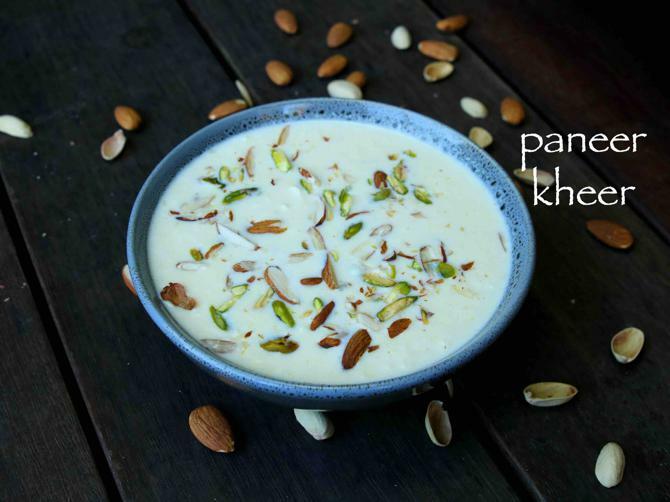 i am not a huge fan of kheer recipes and i personally prefer the hard or sugary sweets recipes. but paneer kheer is an exception and perhaps one of my favourite payasam recipe till now. the main reason and obvious one is due to the paneer. i love paneer recipes and i make sure my fridge has always a block of cottage cheese for my unexpected paneer cravings. the other reason i like to paneer payasam is due to the preparation time. 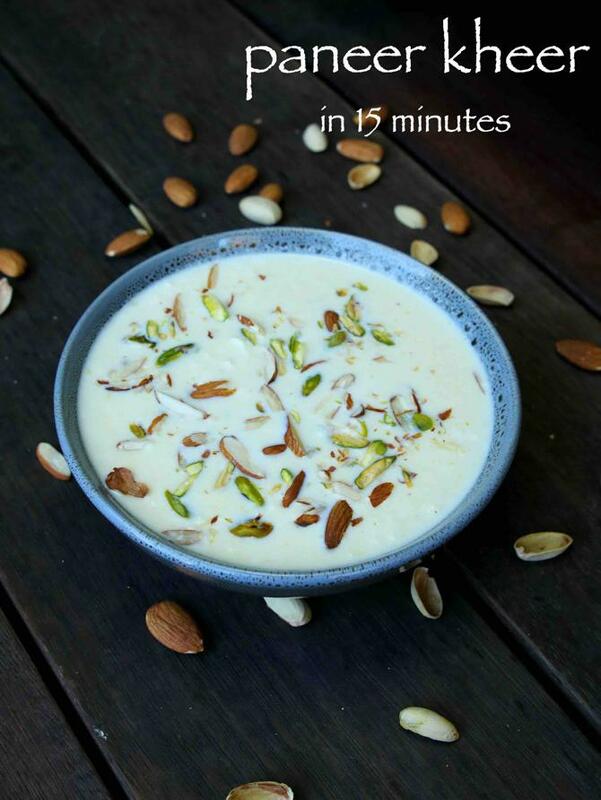 basically the kheer can be prepared within 15 minutes without much hassle. trust me it is a life saver when you have surprise guests at your home. 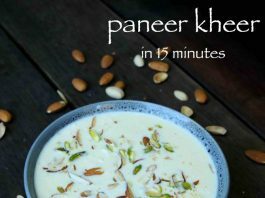 further some easy tips and suggestions for a perfect and creamy paneer kheer recipe. i have used the homemade paneer in this recipe and hence i was able to achieve moist and creamy payasam. i would recommend to use moist and fresh paneer if you are planning with store bought. secondly, do not prepare the kheer thick and try to grate paneer as fine as possible. you can control the thickness by adding milk. lastly, you can even add condensed milk as an alternative to milk. if condensed milk is used, skip adding sugar as condensed milk has required amount. 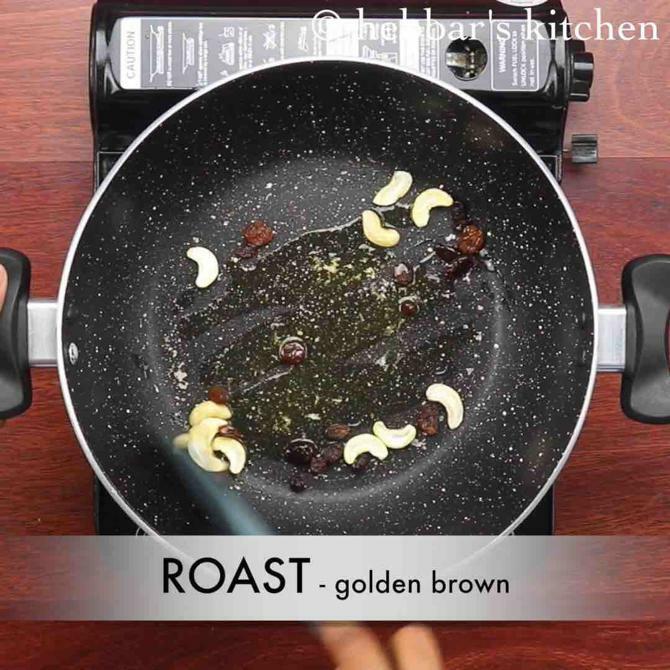 firstly, in a large kadai heat 1 tsp ghee and roast 5 cashew, 1 tbsp raisins to golden brown. add in 3 cups milk and stir well. get the milk to boil keeping the flame on medium stirring occasionally. 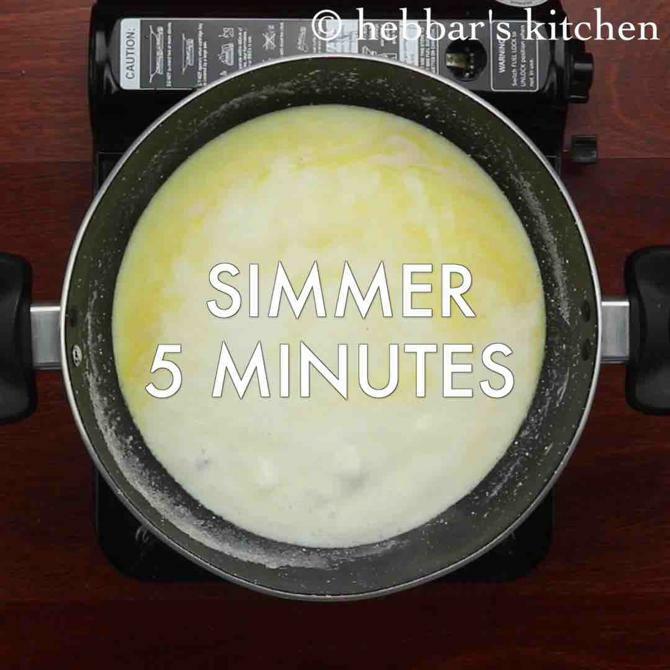 simmer for 5 minutes or till the milk thickens slightly. 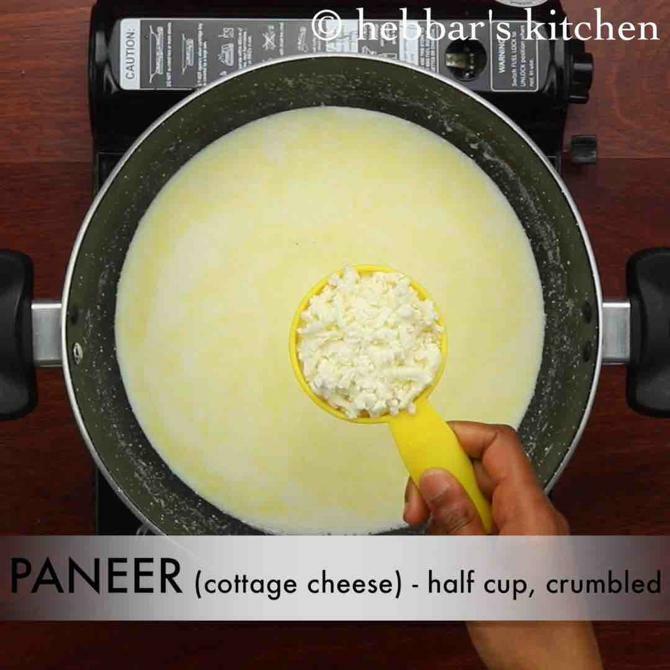 further add ¼ cup sugar and ½ cup crumbled paneer. mix well. 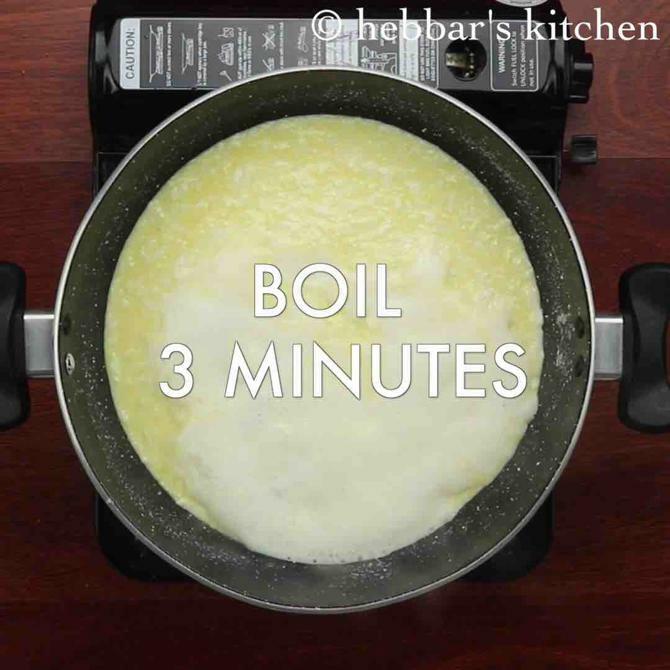 boil for 3 minutes or till the paneer gets cooked well completely. 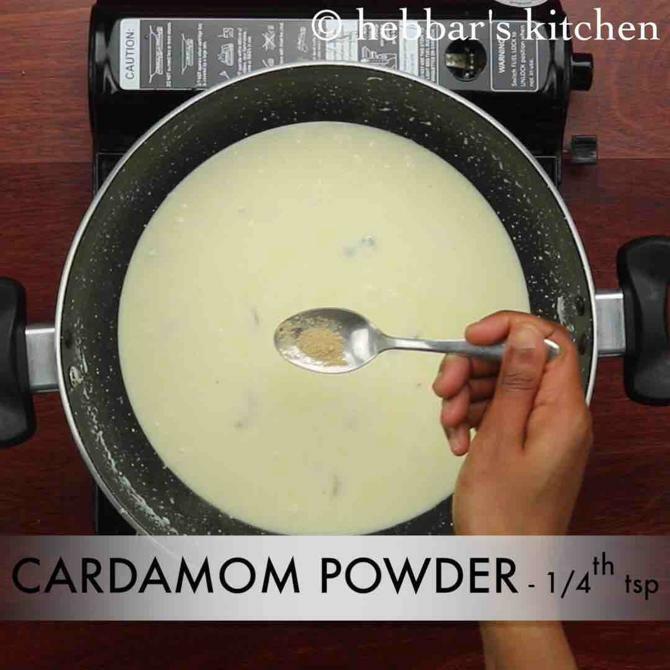 add in ¼ tsp cardamom powder and stir well. finally, serve paneer kheer hot or cold garnished with few dry fruits. firstly, use fresh homemade paneer for more flavours. also add dry fruits of your choice to make it more healthy. 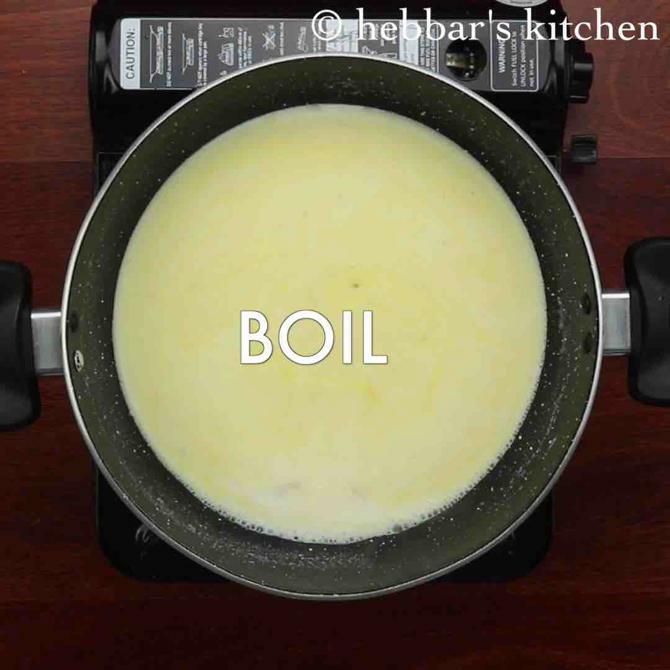 adjust the consistency of kheer by adding more milk. additionally, to make instant paneer kheer use condensed milk and skip sugar. finally, paneer kheer stays good for a week when stored in refrigerator. Today I prepared paneer Kheer it really tasted sooo tasty my kids loved it.Thanks!! Wow. Its looking grt. Keep going. I want to know how do u cut the dry fruit long long pieces for sweets. I am unable to do that. Any machine specially used for that. Kindly guide. You are the best mam! you always make easy recipes . Thanks!